Use Bruce Lee Workouts To Get Strong! 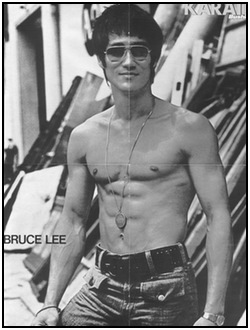 Bruce Lee workouts made Bruce famous for his ripped, powerful body. Bruce isn't famous for his acting ability (really! ), but nobody cares because his martial arts were awesome. So here're the workout routines that Bruce used to get ripped. Use them, examine them, analyze them - somehow employ them to make yourself stronger! Though they're pretty basic, you can see in the beginner one that Bruce was (unsurprisingly) heavily influenced by the bodybuilding culture of the late '60s and early '70s. He used many smaller lifts, and excessively focused on his bicep muscles - a more balanced program might be better if you're just starting out. But if you're still committed to following in Bruce's footsteps - go for it! These 13 exercises gave him the foundation of his muscular strength. I've written descriptions of the (slightly) more obscure exercises below. This exercise primarily works the tricep muscles. Standing or sitting, grab a barbell palm downward with your hands pretty close - about two or so hand widths apart. Then position the weight behind your head and press it up toward the ceiling. Your elbows should be the only joint moving, and your triceps should be doing the bulk of the work. Oh, and keep your elbows in toward the sides of your head. Letting them cheat out places excessive strain on the elbow, which can go nasty places. This is a bicep curl that works to isolate the bicep muscles. Grab a dumbbell in each hand and sit down on an inclined bench (so you're sitting upright at an angle). From that sitting position, simply curl the dumbbells up to your chest and then lower them. Since your body is supported, you can focus soley on the bicep action. This is another bicep exercise. 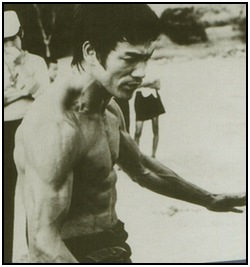 Early Bruce Lee workouts have a lot of bicep exercises - he wanted big arms. Sit down on a bench and grab a dumbbell in one hand. Then balance that elbow against the inside of your thigh. E.g. weight in left hand would have your elbow balanced against the inside of the left thigh. From that position, curl the dumbbell up to your shoulder. This works one bicep muscle at a time, and helps to isolate that muscle from the rest of the arm muscles. This is simply a one-arm version of the French press (above). Use a dumbbell in one hand, let it go behind your head, and press it upward toward the ceiling, using primarily your tricep muscle. This is a fun (meaning: painful!) wrist exercise. Hold a dumbbell in each hand, arms extended straight out in front of the body, and twist the dumbbells back and forth as many times as you can. 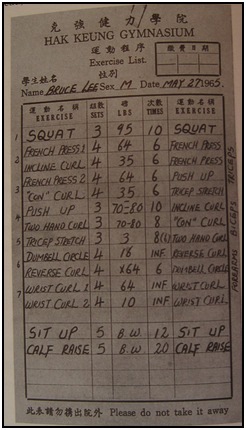 To the right is a workout card used by Bruce Lee when he went to the Hak Keung Gymnasium during a Hong Kong trip in 1964. Photo fromThe Art of Expressing The Human Body. We don't know exactly what he did all the time, but based on the workout routines he did leave behind and the ones he drew up for his students, this is what his workout looked like. So it's probably right. This one of the Bruce Lee workouts was done three days a week, Tuesday, Thursday, and Saturday. It reflects a more balanced approach to weight training that his beginning workout, and shows that as he matured he became less focused on cosmetics (like making his biceps bigger) and more focused on functional strength. He especially began to appreciate compound exercise movements. You know, big multi-joint lifts like the squat and bench press. These lifts do a great job of working your entire body with a minimum of time spent at the gym. Fun Training Tip: Bruce used to recommend to his students that when squatting they take many deep breaths between each squat. Also, he said it was good to hold your breath while squatting (using the valsalva maneuver), which pressurizes your body and makes it a bit easier for your body to do the lift. You can use these Bruce Lee workouts to build strength yourself - your own Bruce Lee body! Or draw inspiration from them and design your own routine, or you can start with a good beginner weight training routine and work your way up to Bruce's general routine. 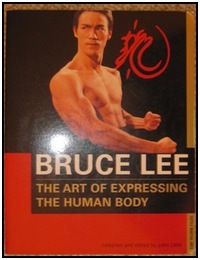 If you're really interested in different Bruce Lee training methods, I highly recommend that you pick up The Art of Expressing the Human Body by John Little. It's THE book for anyone doing research on how Bruce became so strong and powerful. • Click here to leave 'Use Bruce Lee Workouts To Get Strong!' & go back to the Home-page! 1. Lee, Bruce, and John R. Little. 1998. The Art of Expressing the Human Body. Boston: C.E. Tuttle Co. Pp. 41-45. 2. Ibid., pp. 40, 42.